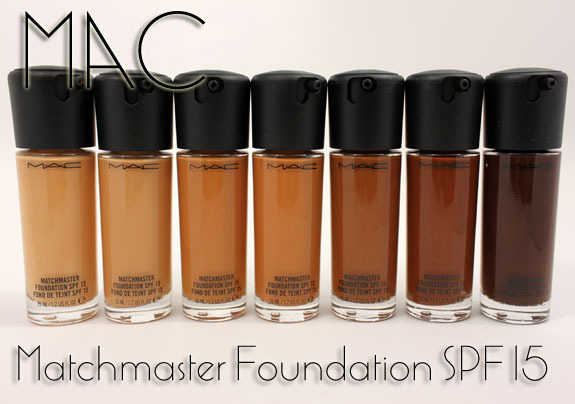 MAC has a new foundation out this fall called Matchmaster Foundation SPF 15. 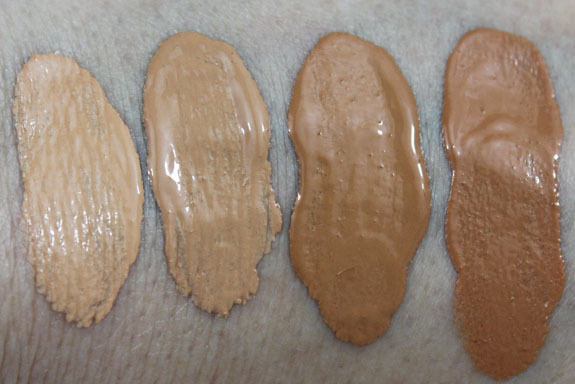 This new foundation spans a wide range of colors starting off with 1.0 and moving to 10.0. There are fourteen shades in all (1.0, 1.5, 2.0, 3.0, 4.0, 5.0, 6.0, 7.0, 7.5, 8.0, 8.5, 9.0, 9.5, 10.0) of these medium build foundations. This foundation was 15 years in the making for MAC and features some patented pigment technology which encapsulates micronized pigment particles in translucent spheres. What that does is give a true-to-life shade to your skin while allowing your natural skin color to show through. The result is a demi-matte finish. This SPF 15 foundation is long-wearing (up to 8 hours they claim) and formulated with Laminaria Saccharina Extract which helps calm skin’s sebaceous glands, which results in less oil being produced. There are also soft focus powders and spherical polymers which help minimize the appearance of pores, lines and wrinkles. As mentioned earlier there are 14 shades and the first two are 1.0 and 1.5. The lightest shade I was sent was 2.0 which is a little dark for me. I think I would probably be a 1.5. But here you can see the differences in 2.0, 3.0, 6.0 and 7.0. 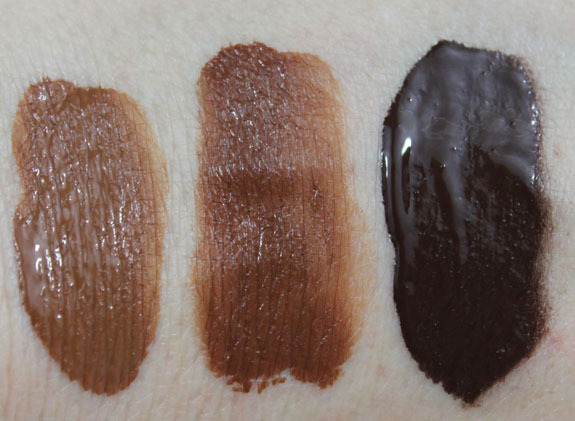 Here are three of the darkest shades, but there is also an 8.5 and 9.5. I did actually wear 2.0 for a full 8 hours or so recently and here are my thoughts. The foundation felt nice going on it was creamy, had decent medium coverage and was easy to blend in. I didn’t use a primer with it (just moisturizer underneath) and it did do a somewhat good job of helping hide my pores and smoothing out my skin. As mentioned it’s definitely not full coverage, and so my freckles and other skin “issues” did come through, but not in a bad way. I was pleased that the foundation didn’t settle into the fine lines under my eyes or forehead even after wearing for hours and hours. It never felt oily on my face and I never had to blot to take away shine. All in all it was pretty nice, though a bit too dark! Are you going to try out Matchmaster Foundation? I’m curious about 1 and 1.5. Even the 15s aren’t quite light enough for my skin as far as MAC is concerned. Actually, the part about calming sebaceous glands worries me too. My skin is so crackly dry that splashing water on it in the morning makes it tight. Sheesh. Hey Z, I’m an NC25 in Pro Longwear and 1.5 is just a hair lighter than that and leans a little yellow. It’s not a perfect match for me at the moment, but I start getting closer to NC20 territory in the winter and I think it’ll be an even better match then. So 1.5 is closer to NC20? I guess that means 1 is probably close to NC/NW15 and that’s still too dark. Ugh. I wish one of these makeup companies made a white to lighten up foundations. Wait…doesn’t somebody? Illamasqua or NARS? Hmm 7 looks like a perfect match for me. I think I would be a 4.0 or 5.0. I can’t wait to try this! I’m not sure if you’re interested (since you’re a mineral foundation person – which I pretty much am too, by default (easier to find color matches, no pore clogging), but it’s terribly drying on aging skin) but MAC offers a “Mineralize Satinfinish” foundation that is also spf15. It’s not too shabby, I really liked it – aside from the “too dark/orange/yellow” parts about it. :/ Thank goodness the associates are nice enough to make samples. Holy grail for me!!! Been wearing it for a week. My problem is looking shiny and this stops the shine for me. MAC foundations turn orange on me, this one did not. I am 1.0 (Nars Mont Blanc; MUFE 115, 025) It is actually clearing up my acne!!!! Oh wow- that’s all really good to hear! You single handedly answered every one of my questions/concerns. Thank you- you rock! how does this compare to mac’s prolongwear foundation. who thinks it better or worse? I was really in love with Matchmaster when I first got it, but after testing it out for a few days I’m losing hope and starting to appreciate my Prolongwear much more. I’m so oily that I need to blot once an hour with just about every foundation I own. Prolongwear is one of the few that noticeably makes a difference (along with EL Doublewear Light) and actually lasts on my face for 8+ hours. I was excited about Matchmaster because of its supposed oil control properties, but it really seems to be making my oil worse. It also starts to break down (i.e. cake up and look blotchy) when oil breaks through whereas with Prolongwear, I get more of an even sheen of oil. It also clings to dry patches. The upside is that it does stay on my face for around 6 hours, and the finish is lighter and more natural than Prolongwear. If you don’t have trouble with extreme oil or dryness, Matchmaster is probably a really good daily foundation while Prolongwear is more of a night out or really long day foundation. I’m still experimenting with different primers, moisturizers, and powders, but I’m not sure I’m going to be able to get this one to work for me. Bummer because I think the finish is gorgeous. Is this a matte foundation?